By Joel Santana on Feb 26, 2016 - 6 Comments. It’s been two years since the release of PopCap’s colorful and easy-going third-person shooter, Plants vs. Zombies: Garden Warfare. While the spin-off was a commendable first entry into the world of shooters, it had a few short comings, including a lack of content outside of its multiplayer and Garden Ops modes. Despite that, Garden Warfare was the first shooter in a long time that I had a genuinely fun time with. 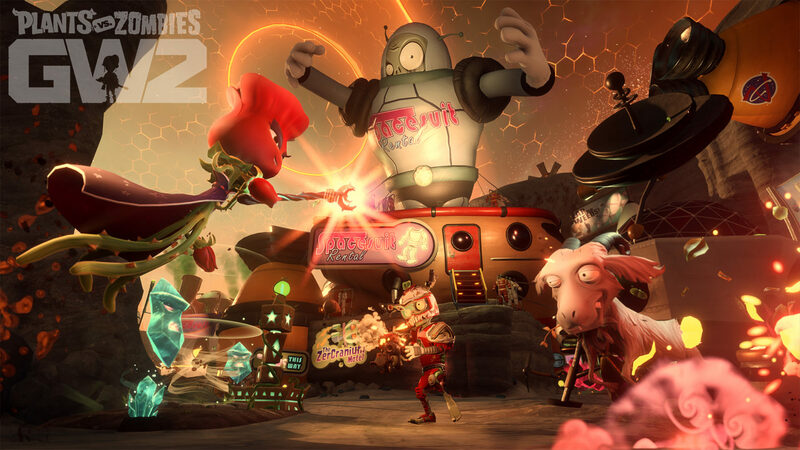 Enter Plants vs. Zombies: Garden Warfare 2, a game that promises to be bigger, badder, and more content-packed than its predecessor while tackling what issues were present in the first game. But does PopCap actually deliver on these claims? To put it simply, yes it does. Garden Warfare 2 feels like a fully-fleshed-out game thanks to the numerous new features inspired by fan feedback. 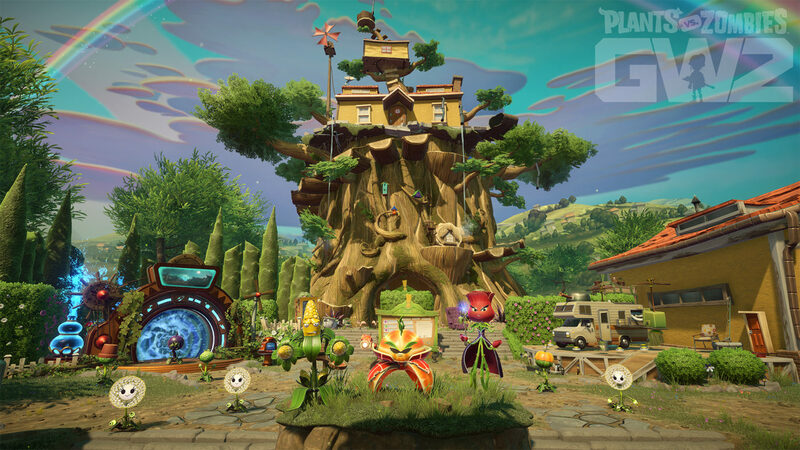 But even with a roughly 6-hour single player campaign, nothing compares to Garden Warfare 2’s biggest and probably the most important feature, the Backyard Battleground. 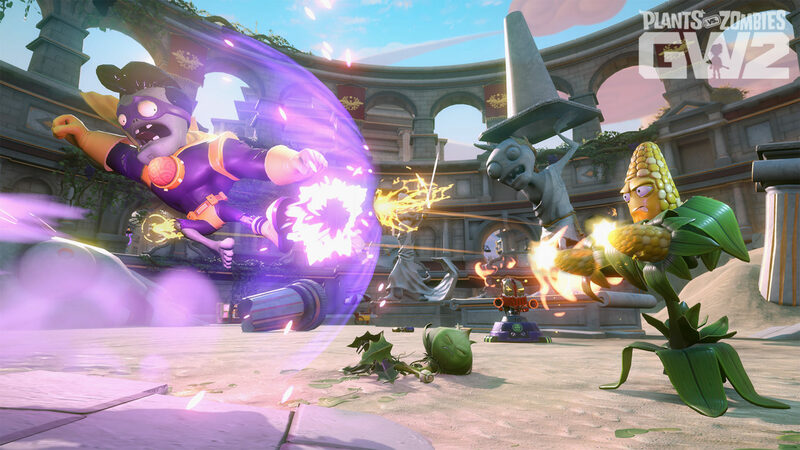 If you haven’t been keeping up with Garden Warfare 2 news, Backyard Battleground serves as the game’s playable central hub, presenting everything the game has to offer in one giant and stunning explorable area. To be perfectly honest, its size is pretty intimidating once you realize there’s a lot more to it than meets the eye. 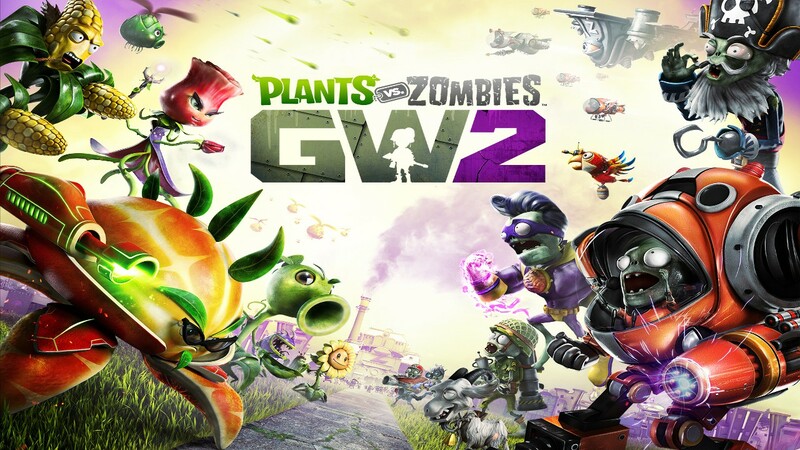 Between both the Plants and Zombies bases are portals or interactive objects that let you hop in to any multiplayer mode to face off against actual players, AI bots, or even both. In addition to bots in multiplayer modes, PopCap also made it possible to start up a private match and customize the settings. These range from choosing exactly who you face to some “craaaazzzy” options like infinite ammo, super speed, or low gravity. All of it can be played with either friends or completely alone with AI companions and/or enemies. PopCap didn’t forget about those who love Garden Warfare’s tower defense mode, Garden/Graveyard Ops, but don’t have anyone to play it with. You can now summon AI companions from the selection of characters to help you defend your tower. Speaking of characters, the progression system has been completely overhauled in Garden Warfare 2. No longer do you have to complete silly challenges or play a certain way to level up your character. Previously, it often made the game a drag to play if you wanted to level up. 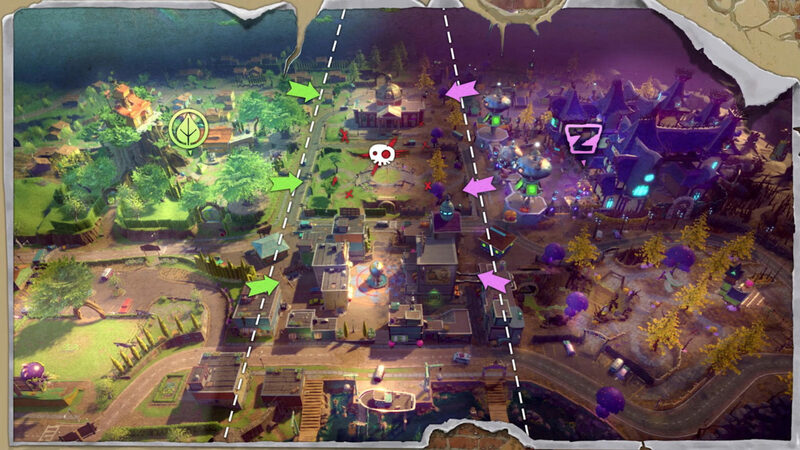 Instead, PopCap introduced the traditional leveling system found in most of today’s shooters where you can level up your character by simply playing the game. Leveling up is a lot easier too, especially if you happen to have the double XP buff active from completing quests. Overall, it’s a step in the right direction. To accompany the new leveling system, a ‘prestige’ system of sorts has also been implemented so that once a character’s variant reaches the max level of 10, you can promote it — up to fives times in total. Each time, you earn a new title and a new character perk for every 5th and 9th rank, along with 20,000 coins. As for the characters themselves, specifically the new ones that have been introduced, they’re generally balanced and fun to play with and complement the original cast. That is, aside from one character who can make playing any multiplayer game a living nightmare. This, of course, is none other than The Rose. Pictured above on the left: the most menacing character in the game, The Rose. What makes The Rose a nightmare to play against is a combination of the amount of damage her main weapon does and how aggressive her tracking ability is. At first, it doesn’t sound that bad, but if you’re playing against a few Roses in any game mode, it’s a bit much. Her main weapon is able to hit anyone from any range just by glancing at their general direction and makes the majority of the Plant team — even the Cactus — obsolete. To make things worse, once a Rose unlocks the Enhanced Homing perk, her main weapon can aggressively track any Zombies to the point that every shot fired will hit them, resulting in a quick vanquish, effectively locking down the Zombie team. Aside from that particular character class needing a pretty big ‘nerf’, Garden Warfare 2 has a few other small issues. The series’ main multiplayer game mode, Turf Takeover, which features both the Herbal Assault and Garden & Graveyards game types, suffers from a lack of maps. Currently, there are only 4 maps with each game type receiving two. Also, when it comes to Turf Takeover, I found myself enjoying the maps from the first game a bit more. Some seem to favor one side more than the other, such as The Great White North, which heavily favors the Plant side. The first area, for example, provides little to no cover for the Zombies and pretty much turns the match into target practice for the Plants. Sadly, despite all the great features PopCap added in the game, one feature that the community was pretty vocal about did not make the cut. 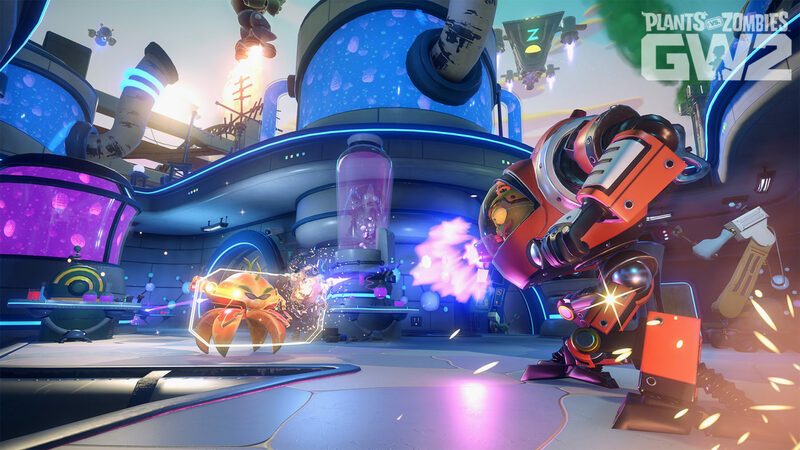 There is no online split-screen for Garden Warfare 2, but seeing as how the frame rate tends to drop while playing split-screen offline, it was likely a wise choice to ditch it. If you must play split-screen with someone, you won’t be missing out on much anyways. As I previously stated, every game mode features the ability to have AI-controlled characters populate your game. If playing against the computer isn’t much of your thing, you and your split-screen buddy can always discover all the hidden areas to explore. And, trust me, you’ll need all the help you can get. Garden Warfare 2 is packed with content right out of the gate and the amount of activities to participate in may even be overwhelming to some. Even at face value, you haven’t really scratched the surface, as a good chunk of the content is actually hidden away, just waiting to be discovered. Without spoiling too much, you’ll be sent on two different quests via hidden NPCs to find hidden collectibles scattered throughout both the Backyard Battleground itself or various multiplayer levels. If item collection isn’t your cup of tea, there’s still a lot to do, including two different ‘endless’ modes. Flag of Power is PopCap’s take on a King of the Hill. One team must take control of a flag located in the middle of the Backyard Battleground and defend it from the opposing team. There’s also an end-game Defend the Tower mode that holds some of the game’s best loot, including legendary character variants, if you’re able to score high enough to earn them. Garden Warfare 2 suffers from a few annoying problems like character balance and a lack of maps for Turf Takeover. 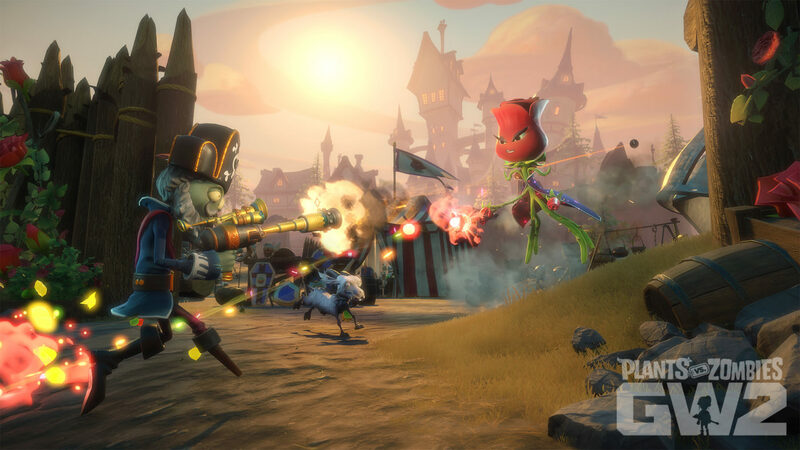 But if PopCap’s history and how they handled the original Garden Warfare is anything to go by, these two issues will be addressed swiftly in Garden Warfare 2’s post-launch support. Even as it, PopCap’s shooter is once again among the most fun out there. Overall, Garden Warfare 2 is a vast improvement from the first game and I was thoroughly impressed with all of the new features added to an already solid core gameplay experience. It’s more than enough to warrant dropping $60 USD on it if you happen to love the original, like I did. It’s also worth mentioning that all post-release content will once again be free of charge. Plants vs. Zombies: Garden Warfare 2 was reviewed on the Xbox One via a review code provided by EA.